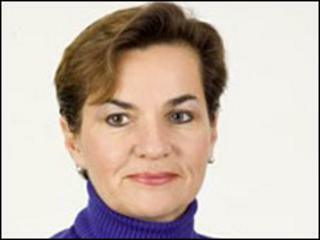 Costa Rica's Christiana Figueres is to be the new head of the UN climate convention, BBC News understands. The UN is expected to confirm her appointment to take over from outgoing chief Yvo de Boer later in the week. Sources close to the UN said she emerged as front-runner after an intervention from small island states. The US-based diplomat, daughter of former Costa Rican president Jose Figueres Ferrer, has taken part in UN climate negotiations since 1995. She emerged as the undisputed front runner only in the last few days. A number of small island developing nations told UN Secretary-General Ban Ki-moon that they preferred someone from a smaller developing country to the other leading candidate, South African tourism minister Marthinus van Schalkwyk. Although respected personally, small island states that feel threatened by climate change are understood to have resisted the appointment of someone from the BASIC bloc of countries (Brazil, China, India and South Africa), which argued against swingeing carbon curbs at December's UN summit in Copenhagen. Ms Figueres has chaired many working groups and committees within the UN Framework Convention on Climate Change (UNFCCC), and is regarded as having a deep understanding of its processes and its outstanding issues. Following her confirmation, her immediate task will be to rebuild confidence in the UN negotiations in the lead-up to this year's major summit in Mexico at the end of the year. "There is this misguided view that the UN system doesn't work," said Martin Khor, executive director of the South Centre, an intergovernmental organisation of developing countries. "What happened [in Copenhagen] was deviation from the UN process with the selection and elevation of a small group of countries. "So if you're the new UNFCCC head, the first task would be to project the correct view that the UN processes, its practices and principles, are respected," he told BBC News. Mr de Boer announced in February that he would step down in the middle of this year to take up a position with global accountancy firm KPMG as a consultant on climate and sustainability issues, and to work with several universities. The Dutch official steered the UNFCCC through the most tortuous phase of its existence, spanning the Bali summit of 2007 that promised a new comprehensive global agreement within two years and the Copenhagen summit of 2009 that failed to deliver such an agreement.